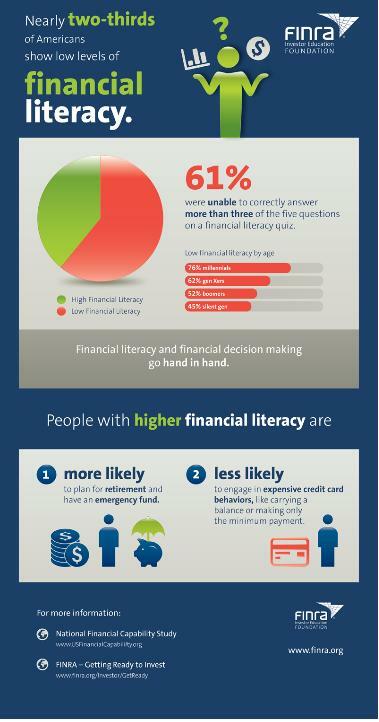 Financial Industry Regulation Authority (FINRA) recently published findings from the National Financial Capability Study (NFCS) regarding the financial literacy of Americans. How financially literate are you? All you gotta do is answer six simple questions to see where you stand. It will take less than five minutes. Are you ready? I encourage you to take the financial literacy quiz and see where you stand. If you scored 100%, pat yourself in the back! If you scored low, don’t worry! You were brave enough to take the test and face the truth. The truth always always sets you free. The first thing in life is always know where you are – once you know where you are, it is easy to choose where you want to be and proceed in that direction. There are several free educational resources available online. MyMoney.gov – this is educational website set up by the Federal Financial Literacy and Education Commission. This is a great resource for anyone to learn money basics. Consumer Financial Protection Bureau – this is another federal government website that has several educational resources for youth, adults, and parents. 100% free. You could check out my education page or several other personal finance blogs that offer high quality education. You could also look into the one on one coaching I offer here. Take the time to educate yourself and be financially literate. You will save yourself a lot of headache by avoiding a lot of financial mistakes. How did you do in the financial literacy test? Do you recommend any good free financial education websites? A good quiz … 100% for me. Thank you, James! I wouldn’t have expected anything less from you :). Thank you, Debbie! I am glad you found the quiz useful.